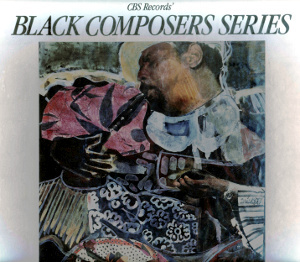 The College Music Society, in conjunction with the Center for Black Music Research, released CBS Records' Black Composers Series in 1987. The Series, recorded by Columbia Records between 1974 and 1979, is available as a boxed set of nine vinyl long-playing records. An informative booklet describing both the music and the lives of the composers is included. The Black Composers Series, an important component of the documentation of Black achievement in western culture, contains music written by Black composers during the eighteenth, nineteenth, and twentieth centuries, and, in part, demonstrates the working out of the Black aesthetic in the western concert music tradition over a two-hundred-year period. Composers whose work is presented are T.J. Anderson, David Baker, Samuel Coleridge-Taylor, Roque Cordero, Jose Mauricio Nunes Garcia, Adolphus Hailstork, Talib Rasul Hakim, Ulysses Kay, the Chevalier de Saint-Georges, Hale Smith, Fela Sowande, William Grant Still, George Walker, Jose White, and Olly Wilson. The works in the Series are performed under the direction of Paul Freeman by major symphony orchestras of the United States and Europe, and by some of the world's leading concert artists. The reissue of CBS Records' Black Composers Series by The College Music Society was made possible by a grant from the Ford Foundation. William Grant Still: "What Does he Know of Dreams" and "You're Wonderful, Mary" from Highway 1, U.S.A.